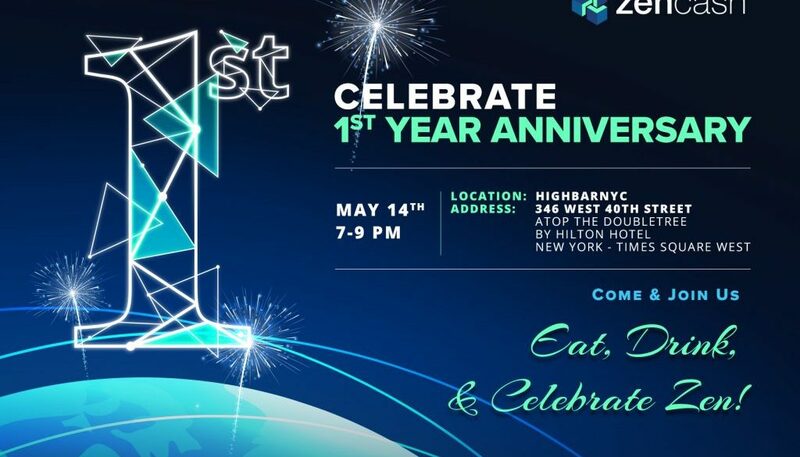 The ZenCash Team is hosting a LIVE anniversary party the first day of the Coindesk Consensus Conference in New York City and you’re invited to attend! There will be food, drinks, music, friends, and lots of fun! ZenCash was launched in May 2017 with only five people, and the project has come a long way. In just one year, the Zen team expanded to 50 team members, and has been surpassing their goals thanks to our supportive community. We want to take this opportunity to thank you all for helping us succeed and thrive in this crazy crypto world! This party is open to our community and will bring together leaders and influencers in cryptocurrency, blockchain, banking, venture capital, FinTech, and startup spaces. Foster inter-industry collaboration to advance this movement. *Attendees are invited to enjoy some yummy food and an open bar from 7:00-9:00 PM. This registration will secure your spot on our waitlist. We will notify you prior to the live launch event if there is capacity for your attendance. Separate invite-only tickets are being distributed through private channels. Eat, Drink, Have Fun, and Be Zen!